Consumers in the U.S. — and around the world, for that matter — have come to expect more of their banks. Users demand constant access to their accounts, with up-to-the-minute insight into account balances, transfer requests and bills scheduled for autopay. The memory of bounced checks is left to a past generation. When banks fail to meet customer expectations, they scurry to make amends, as was the case when Wells Fargo experienced a large-scale outage in February. Customers were left without online bank account access, debit cards proved temporarily useless and ATMs were rendered inaccessible. Wells Fargo's trials were the result of routine, on-site data center maintenance but highlighted the need for continued investment in data management modernization. A clear line is emerging in the banking industry, separating organizations investing in technology transformation from those merely keeping systems running. Companies like Bank of America and J.P. Morgan Chase & Co. with assets above $100 billion are more likely to increase technology spend in the coming years, according to a recent report from UBS Evidence Lab, which surveyed more than 200 IT decision makers working at U.S. Banks. UBS interviewed professionals from 175 banks of different sizes. By comparison, banks with less than $100 billion in assets face budget constraints as the leading risk for a successful technology strategy implementation, according to the report. Banks have delayed modernization and a transition to "hypermodern applications" because of reliance on proven, "heavy-duty solutions" and a risk-averse attitude, according to Jost Hoppermann, VP, principal analyst at Forrester, in a December report. Though complete failure is uncommon, transformation efforts often have "time and budget overruns," said Hoppermann. As one CIO at a small retail bank in the U.S. put it, according to Hoppermann: "My time as CIO will end before the technology organization can complete a large-scale transformation project. Why should I take the risk if I won't personally benefit?" The largest banks in industry are outpacing competitors in technology investment, rapidly moving to the cloud and implementing emerging technologies like artificial intelligence and blockchain. Notably, those banks — Bank of America and JPMorgan, in particular — "view innovation as core to digital banking efforts," according to the UBS report. Together, JPMorgan and Bank of America account for 22% of total deposits in the U.S. and gained more than one-third of new primary bank relationships in 2017 and 2018. Analysts attribute those banks success now, and in the future, to investments in technology and efforts to modernize. In 2018, JPMorgan spent $10.8 billion on technology. Half of the budget is dedicated to changing the bank, with investment in platforms, data, new technology and modernization, according to the UBS report, citing conference transcripts. This year, JPMorgan has earmarked $11.4 billion for technology spend. JPMorgan's budget eclipses investments made in smaller banks. And as a whole, technology spend accounts for a larger portion of big banks' expenses, according to UBS. Half of those surveyed from smaller banks, those with between $51 billion and $100 billion in assets, spend less than $100 million on technology annually. The lack of investment will further delay modernization, as aging technology taxes the customer perception of a bank. If customers can receive better services and technology capabilities from larger organizations, they could flee smaller banks. 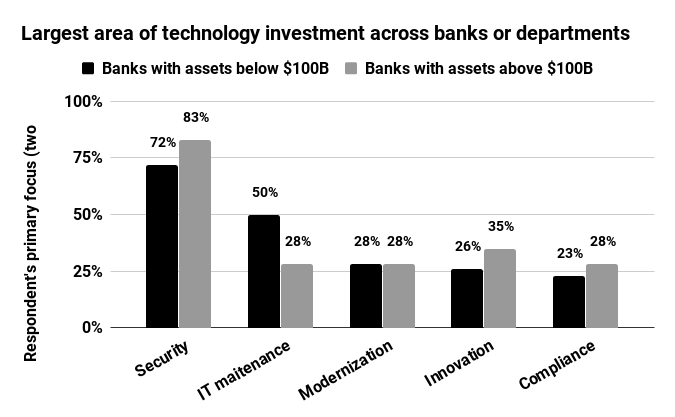 Big banks are increasing their annual technology investment and small banks, with constrained budgets, often delay modernization. What are those big banks investing in? Certainly not just IT maintenance (as is the case with many smaller banks). Focused on innovation and increased revenue, large banks invest far less in IT maintenance than smaller organizations, according to the UBS report. Regardless of the size of the organization, banks are spending large portions on security. Most banks are at the midway point in terms of modernizing legacy systems, but the banking industry still has a tenuous relationship with the cloud. In the cloud realm, Capital One stands out. With many financial services hesitant to adopt a public cloud strategy, Capital One wants to move as many of its apps to the cloud as possible, in addition to building cloud-native apps. Regulatory restrictions make it difficult for many banks to use software as a service offering in the cloud, leading some to run software in a private cloud on an in-house data center, according to Hoppermann. "Smart leaders should choose banking application vendors that can deliver cloud-native applications and offer cloud-based delivery and test mechanisms," he said.